Olaplex is a revolutionary new hair colour upgrade service that is quickly gaining popularity among celebrities and around the world. So what’s all the hype about? Olaplex helps repair the bonds that are broken during chemical services such as hair colouring or using heated styling tools. Since these bonds, called disulphide bonds, give hair its strength and elasticity, harsh chemical services can sometimes lead to hair that is weak and brittle. 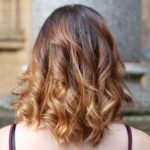 By adding Olaplex to your hair colour or lightening service, you can help reduce the damage and rebuild the bonds in your hair. First, your stylist will add the Bond Multiplier to your colour or lightener and then apply the Bond Perfector after the colour is rinsed from your hair. The Hair Perfector can then be used once a week at home to further strengthen your hair after your service is done. It can also be used as a pre-treatment for future chemical services. Unlike conditioning or protein treatments, Olaplex repairs the hair from within. It restructures the hair from the inside and can make even the most brittle or over-processed hair ready for treatment again. It can even be used with perms or relaxers, making it possible to highlight or colour hair immediately after the first service! Olaplex works on all hair types and does not “build up” in the hair over time. At least not in a negative way… but your hair will continue to get stronger, the more you use it! So what are you waiting for? Ask your stylist about adding Olaplex to your next colour service!